We’re lucky to live in such a beautiful part of the world, and Whidbey Island is one of the reasons we love this area so much. 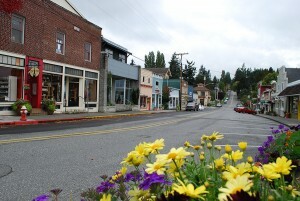 Whidbey Island is the largest island in Washington, and it’s full of charm, character, great hospitality and adventure. The best part about a Whidbey Island day trip is that you can see and experience the entire island in less than 24 hours. Last spring, a friend of ours told us about an incredible Whidbey Island day trip he takes with friends. After telling us about his adventures, we knew we had to plan a similar trip. 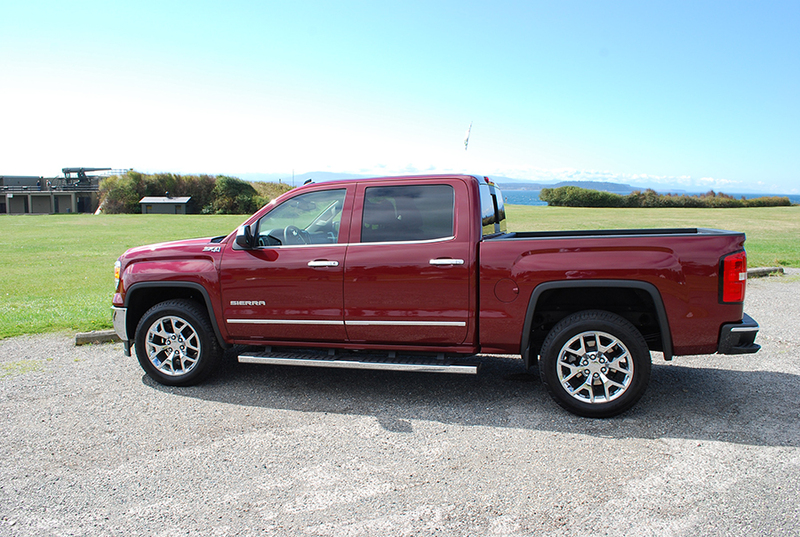 Once we were approached by GM a to test drive their 2014 GMC Sierra a few months later, we knew a Whidbey Island day trip would be a perfect fit for our drive. We were right! Our day was packed to the brim with one adventure after another. If you only want the short and sweet version of our Whidbey Island day trip — here it is (click on the links for our pictures and videos): We started our Whidbey Island adventure by taking the ferry from Mukilteo to Clinton (that means we traveled south to north on the island). We drove to Langley, and then explored Greenbank Farm, Fort Casey State Park, and Ebey’s Landing. Coupeville was the next stop for lunch, before we spent the late afternoon at Deception Pass. For a visual of the day, check out a map of our trip. While it seems like a lot to do in just one day, it is all very do-able. Without further ado, here is the full breakdown of our Whidbey Island day trip! 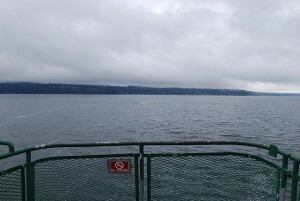 We started our day in Mukilteo (about 30 minutes north of Seattle) and caught the short ferry across the water to Clinton on Whidbey Island. Our first stop on the island was sleepy Langley. It only takes about 15 minutes to get to Langley from the ferry dock in Clinton. We stopped for coffee and pastries at PS Suisse (where they only take cash) and did some window shopping around town. We stopped into Sweet Mona’s chocolate shop, where we talked to the friendly owner and picked up some homemade caramel for the road. Something unique (and a little funny/strange) you’ll likely notice about Langley is all the bunnies hopping around town. Tim and I stopped on the side of the road to take some pictures of them. 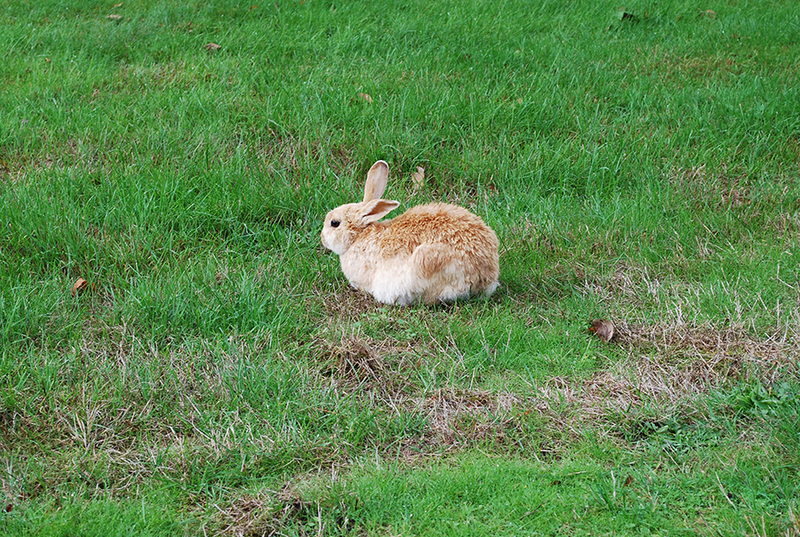 A local woman told us that someone let their domestic bunny loose after the county fair in Langley a few years ago, and now the bunnies are all over the place. She said there have been days when 20+ bunnies have been hanging out in her backyard. Pretty nutty, huh? Apple pie from Whidbey Pies & Cafe. After Langley, Tim and I made the 15 minute drive north to Greenbank Farm, which boasts art galleries, a winery, cheese shop, gardens and trails. It is also home to Whidbey Pies & Cafe. After browsing through the art galleries, Tim and I stopped into the cafe for their famous pie. It was only 11:30am when we walked in, but the woman who greeted us at the cafe knew we were there for the pie. Whidbey Pies & Cafe makes nearly every type of pie you can imagine, including marionberry, blueberry, apple, peach, rhubarb and strawberry, cherry, triple berry (strawberry, boysenberry, and blueberry) and even salted caramel apple pie. 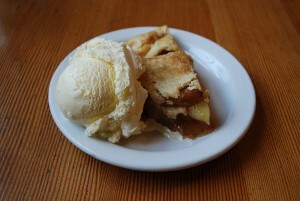 While everything sounded delicious, we opted to keep things classic with the traditional apple pie with ice cream. The pie was served warm, and then it was gone in a matter of seconds. My only regret is not buying an entire pie to go. 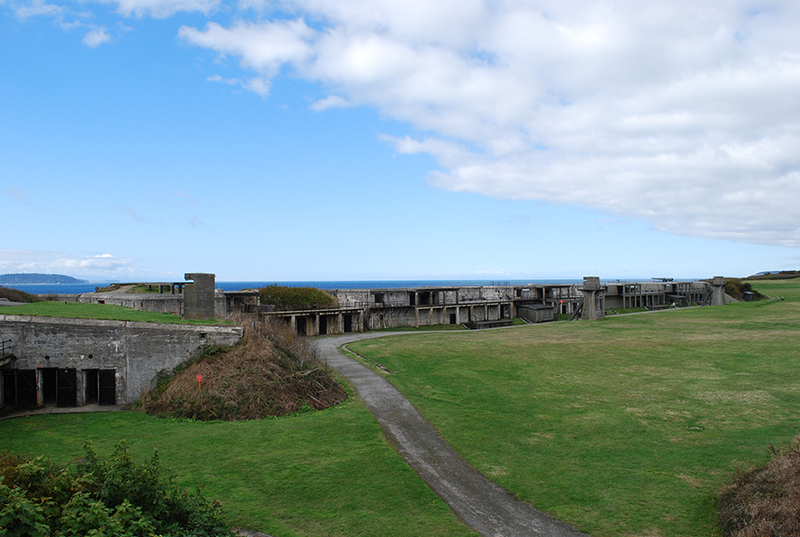 The third stop on our Whidbey Island day trip was Fort Casey State Park. This is easily one of our favorite state parks in Washington. We both camped at the park as kids and loved going back to explore it as adults. The park used to be home to one of three artillery posts positioned around Admiralty Inlet that protected the Puget Sound in the late 1800s and early 1900s. Today, all three posts have turned into state parks and are open to the public. (We visited one of the other posts, Fort Worden, in Port Townsend earlier this year). 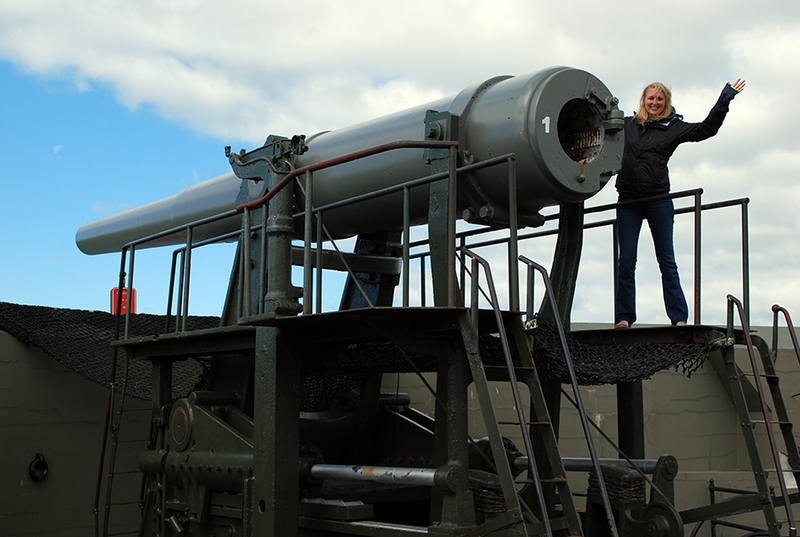 Fort Casey has one 3-inch and two 10-inch guns on display. You can go right up to the guns, walk around the old concrete post and explore all the different rooms. It would be a great place for hide and seek. 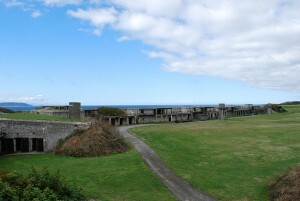 In addition, Fort Casey State Park offers incredible views of the Admiralty Inlet and the Strait of Juan de Fuca. Next, we headed to Ebey’s Landing National Historical Reserve, which ended up being one of our favorite places of the day. It’s a beautiful part of Whidbey Island, which includes a beach and old farm land. The views are out-of-this-world-breathtaking. We both had a “Wow!” moment when we arrived. You can stroll the beach, sit and enjoy the sound of the waves, or hike the 5.5 mile round-trip hike around the landing. We loved just sitting on the beach and taking in the scenery. While we didn’t do the entire hike, we did the first little bit to get a better view of the water. 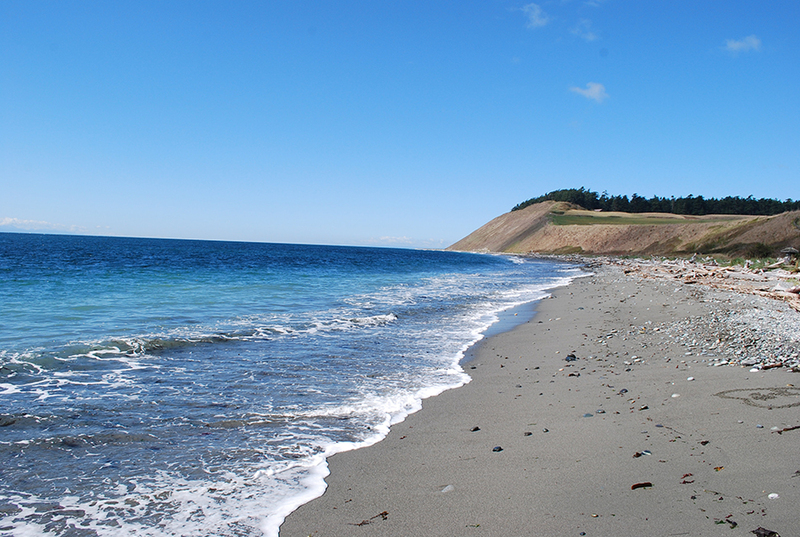 We can’t wait to go back again to explore more of Ebey’s Landing. Penn Cove mussels from Toby’s Tavern. After we stomped around Ebey’s Landing, it was close to 1:30 pm and we were getting hungry, so we headed to Coupeville (less than a 5 minute drive) for a late lunch. The small town located on Penn Cove is quaint, has lots of charm and is loaded with history. Founded in 1852, it’s the second oldest town in Washington. We stopped at Toby’s Tavern and ordered a pound of Penn Cove mussels. 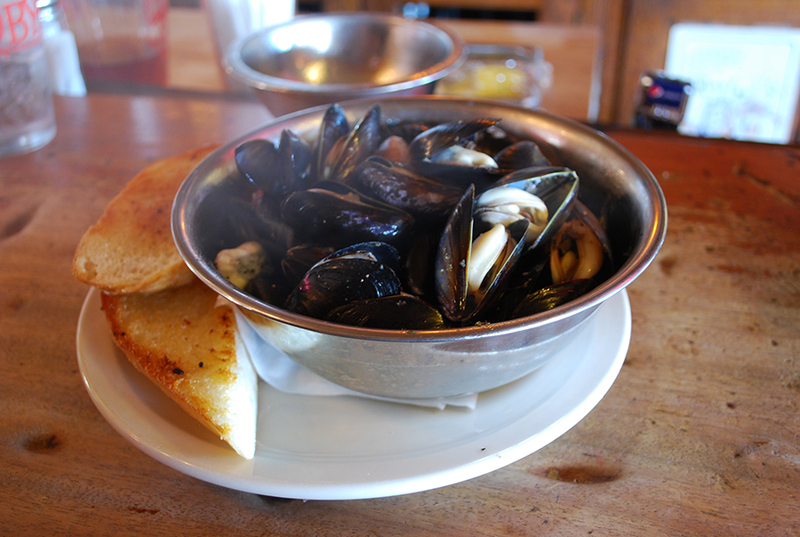 The mussels are known around the world and are taken right out of Penn Cove in Coupeville. The mussels (we ordered one pound) were delicious and were the perfect lunch for two. I downed the mussels with a pint of Toby’s Red Parrot Ale, a beer made exclusively for the tavern. For dessert, we popped into Kapaws Iskreme. They do things a little different here. A “single” is 3 scoops, while a “double” is five scoops. I loaded up on rocky road, praline pecan and salted caramel, while Tim ordered salted caramel, wolf tracks (vanilla with fudge swirl and peanut butter cups) and coffee almond fudge. The salted caramel ice cream is AMAZING. Another interesting fact, Seattle’s Best Coffee was founded in the same building the ice cream shop is now located in. While in Coupeville, don’t forget to check out the pier (called Coupeville Wharf). When you’re on the pier, you can see the Penn Cove mussel beds (if you look west at the end of the wharf), which is really cool (especially after eating a pound of the little guys). The pier also gives you a great view of the town and Penn Cove. We ended our Whidbey Island day trip exploring Deception Pass State Park. This is another one of our favorite state parks in Washington (the parks we visited on our Whidbey Island adventure are worth a visit to the island alone). 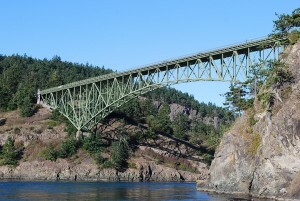 Deception Pass is a strait separating Whidbey Island from the mainland, with a two-lane bridge going across. The park is 4,134-acres and is the most popular park in the state. 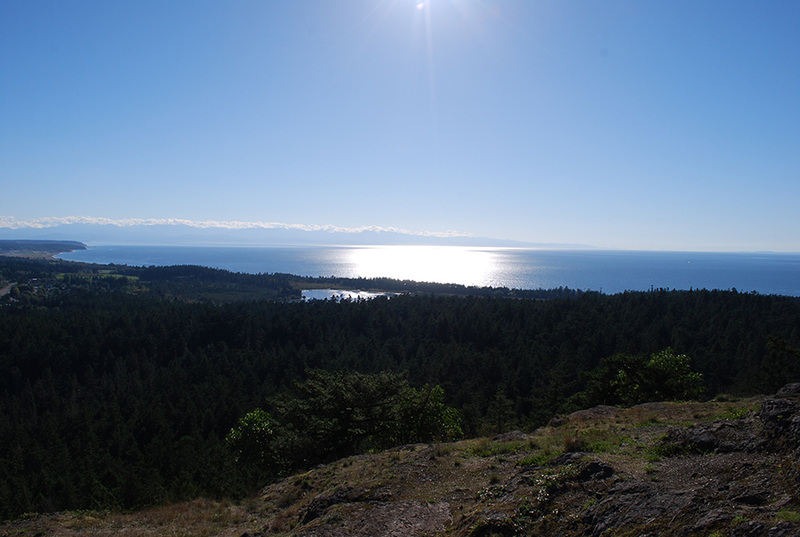 There are more than 40 miles of hiking trails and breathtaking views of Puget Sound, Skagit Bay and the Strait of Juan de Fuca. Tim and I parked in the north parking lot and followed the trail to the famous Deception Pass Bridge, and then wandered onto the bridge’s skinny sidewalk to see a view of the water from up high. We also spent time on the beach below the bridge. Even though we visited in September, the sun was out and the sky was crystal blue. We also did some hiking at Deception Pass State Park. Thanks to a recommendation by a friend, we hit up the Goose Rock trail. The steep, 2.5 mile roundtrip hike is awesome. 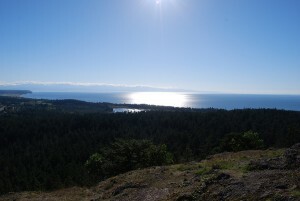 The top offers incredible views of Whidbey Island and the Puget Sound. We were so far up that I felt like I could see every stop we made on our day trip. We hear it’s a wonderful place to watch the sunset. The Goose Rock hike was a fantastic way to end our Whidbey Island day trip. I was sad to see our Whidbey Island day trip come to an end. It was an action packed day, full of awesome food, views and wonderful surprises. It’s something I’d do again in a heartbeat. 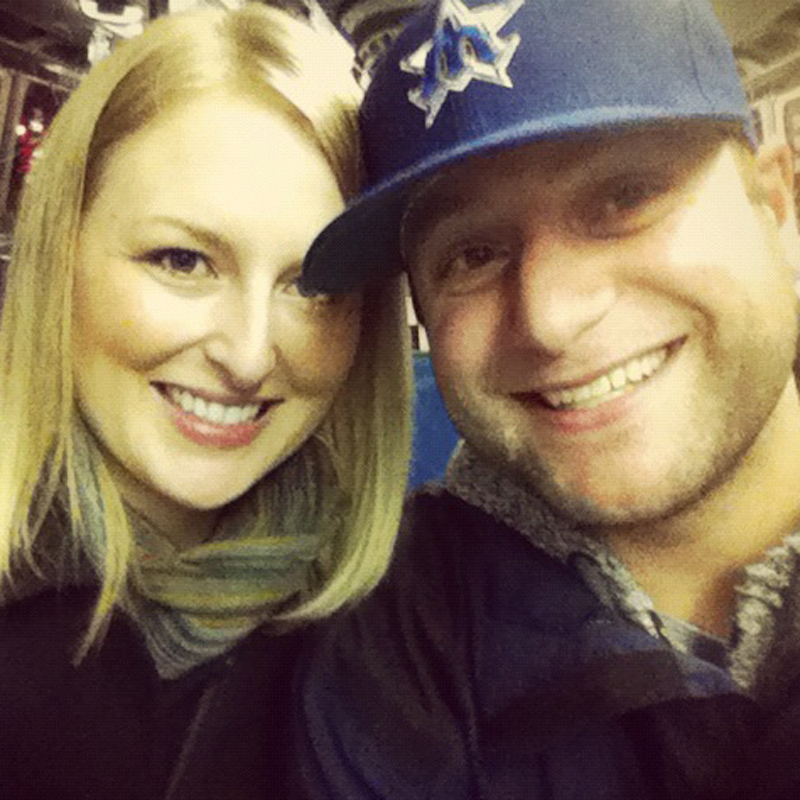 Tim and I spent the entire ride back to Seattle talking about our favorite stops. One of the things I will take away most from our trip is how friendly everyone was. I’m not sure if it is something in the water, or people on Whidbey Island are just full of friendliness. The residents are extremely welcoming. It really added to the experience. Have you ever visited Whidbey Island? Do you have anything to add to our Whidbey Island in a day adventure? We’d love to hear from you. Leave a comment below or connect with us on Twitter, Facebook and Google+. Don’t forget to also check out Seattle Bloggers for more on great things to do in the city and around the region. Thank you so much for this great post! We are planning a day trip to Whidbey Island tomorrow and plan on using this as a guide. It’s a great starting place. Thanks! We’re always happy to be of assistance! We hope you have a FANTASTIC Whidbey Island day trip with your family. Please let us know how it goes! I know this was a day trip for you but am wondering what time you started and ended? Was it a first ferry/return at 8pm kind of day? I’m thinking of doing this itinerary with my husband, visiting mum, and my 14 month old and was thinking if it is a super long day it might require an overnight in Coupeville for us. But maybe not. TIA. A two day trip would be well worth it, as they barely skimmed the surface. Whidbey hosts a dozen garden centers and nurseries, including Sally’s garden and lavender wind farm, two of my faves. Also wineries, like ott-Murphy, and plenty of art galleries in Coupeville and Langley. Enjoy! This is a great guide:-). I visit my brother on Whidby each summer from RI and I’m always amazed at what New places I find to explore, hike, etc. One of my favorites is collecting sand dollars when the tide goes out. I’ve made many beautiful presents with them. I’ll take your itinerary tour in Aug when I go out. Thanks! There are plenty of Wisconsin transplants here! Look us up at the Bayview Farmers Market on Saturdays and I will connect you with a few! You and your family will love it here! Welcome! This place is great for families! We moved here with our kids 13 years ago because the housing was cheaper and never regretted it. It is amazing here. Thanks for the great agenda for a day trip in Whidbey! We did the route in reverse based upon the comments above (get to langley in the afternoon vs the morning). Deception Pass was great. Instead of hike, we took pics on the bridge and saw Rosario Beach. Toby Tavern and mussels were awesome. Ebey Landing was the highlight. Others could consider adding a winery for the afternoon. After ferry ride to Mukilteo – we stopped by Diamond Knot for a beer and watch the sunset fromt there. Thanks and great day trip agenda! Great story of your trip to Whidbey! However you drove right past one of the most fun spots for the locals and also visitors. Bayview Farm & Garden…awesome cafe and the laburnum arbor is famous. The laburnum is gorgeous right now! Bayview Farm and Garden is always a joy to stroll through… and makes a perfect coffee stop too! Sorry you missed the awesome town of Freeland. It hosts several great restaurants, wine tasting, a nice Motel, two great Antique Malls, and a great Public Beach with a playground for the kiddies. Be sure to check it out the next time you are on the Island. Thanks for the post. This post really helped us in having a great on Whidbey island. The wife and I enjoy our time when ever we visit the island, laid back atmosphere and it seems we find something different all the time. Thank you for this information. I live in Calif., but visit family in Port Orchard, WA quite often. We are finally planning a trip to Whidbey Isl. on Sept. 25 & 26. Decided to spend a night in Oak Harbor because we were concerned about the distance from P.O. and doing only a day trip. Planning to Ferry from Bremerton, then drive to Mukilteo. Does this sound like we could do it in a day without the hotel expense? Always on a budget. Hi Joyce! That may make for a long day. I think it just depends on how much energy you have! Have you looked into taking the ferry to Port Townsend to Coupeville? That may mean you’ll have to switch the the route around a little bit but it could cut off some time. Thank you for this, Tove. My husband and daughter and I will be on (in?) Whidbey Island in November, and your itinerary and thoughts are so helpful. First off…welcome to the beautiful Pacific Northwest! 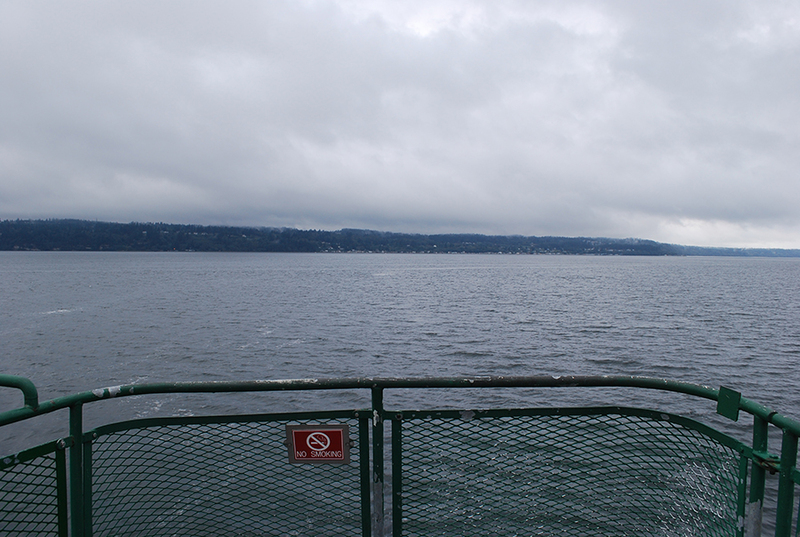 Second…we’re glad you enjoyed your trip to Whidbey Island. Thanks for leaving a comment! We followed this itinerary yesterday with the exception of visiting the farm. It was AMAZING!! 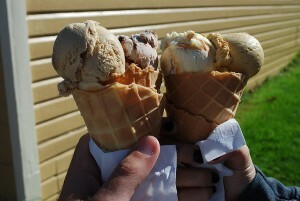 thank you so much for this blog, it is literally the best way to see Whidbey in one day. We did this trip last week and it was terrific. Our favorite places were Langley and Deception Pass. PS Suisse in Langley is now closed so we went to the Useless Bay Cafe instead. Our 13 year old son really enjoyed exploring Fort Casey. This trip is definitely a great way to spend a day in the Seattle area and easily achievable as long as you get a relatively early start. We started from downtown Seattle about 8 AM and got back around 6 PM. Anyhow, thanks for this blog post!